With Eddie Thawne still missing, The Reverse Flash on the loose and a new robber targeting gold depots around Central City, The Flash is running himself ragged trying to keep up. But all of that pales to Barry Allen's latest problem. Iris has discovered his secret identity and she is pissed about everyone lying to her! Yet even an enraged Iris pales in comparison to The Reverse Flash's ally - a super-size, super-intelligent, psychic gorilla named Grodd! The Flash comics of John Broome, the Planet of The Apes movies (Cisco makes multiple jokes about the films and a super-intelligent monkey uprising) nd Aliens (the Grodd-hunting sequence in the sewer). While the chances of methane explosions in a modern sewer are minute, it still seems incredibly risky to use ignitable flares to mark a trail as Joe does. Candice Patton has had a thankless job for the better part of the season, playing a love interest that Barry Allen can't have and a reporter who seemingly has no investigative skills worth a damn. With this episode, however, she gets to buy it all back and let loose her justifiable outrage over everyone she knows lying to her for the better part of a year. And it is glorious. First appearing in The Flash #106 (May 1959), Gorilla Grodd is one of The Flash's oldest and most dangerous enemies. In his original origin story, Grodd was one of several gorillas given enhanced intelligence by a radioactive meteor. Grodd and another gorilla, Solovar, would also develop telekinetic and telepathic abilities. Originally, the same meteor that empowered Grodd was also responsible for giving the same psychic powers to Green Lantern villain Hector Hammond. Grodd's background has been retconned a few times over the years, with the small group of super-intelligent apes expanding into a great society of super-intelligent apes who evolved naturally and kept their home hidden from humanity. The source of Grodd's psychic abilities has also changed over the years, ranging from radioactive meteors to alien intervention to the result of a lab accident. The DCTVU version of Grodd sports the same powers as his comic book counterpart, possessing telekinesis and telepathy. He is also larger and stronger than an average gorilla, being able to shrug off a volley of The Flash's punches at superspeed and survive being hit by a subway train. 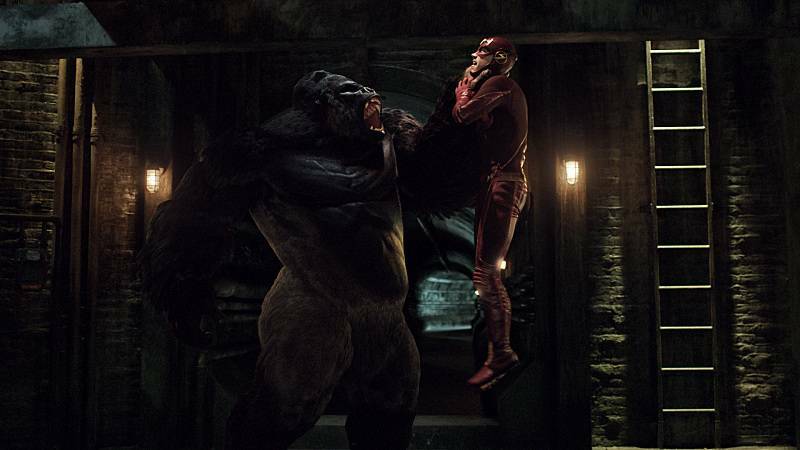 Grodd also seems to have developed enhanced reflexes which allow him to perceive and block The Flash's attacks. A mention is made of Coast City - home town of Hal Jordan - the Silver Age Green Lantern in the DC Comics. Joe refers to the thief targeting gold shipments as Goldfinger - a nod to the gold-loving, gold-stealing James Bond villain. When it comes to movie references, Cisco is still the king and is called out on this by Grodd through General Eiling when Cisco compares Eiling's behavior to that of the possessed girl in The Exorcist. Cisco also makes references to Rise of the Planet of the Apes ("I think we know what happens when a super-intelligent ape who's pissed off at humans escapes captivity..."), C.H.U.D. (Iris' reports about monsters living in the sewers) and The Princess Bride (a reference to Rodents of Unusual Size - R.O.U.S.es). He later compares Grodd's stalking them in the sewer to Jurassic Park. As in the DC Animated Universe, Grodd hates bananas and resents being given them by humans. Caitlin first theorizes that Eiling's unresponsiveness is due to some form of trance or a form psychotic break resulting in Disassociative Identity Disorder. Five years earlier, Wells and Eiling worked together on a project intended to expand soldiers' cognitive abilities during battle. In truth, Eiling was trying to create soldiers with psychic powers - particularly telekinesis (moving objects by thought alone) and telepathy (mind-reading and mind-control). According to the brain scan Caitlin did of Grodd right before the particle accelerator explosion, Grodd's primary motor cortex and Broca's area were - as Barry describes it - lit up like a Christmas tree. General Eiling's brain scan is lit up in the exact same way. Caitlin theorizes that Grodd's found a way to transmit neural signals to Eiling's primary motor cortex, effectively controlling his mind. Later, after Barry is attacked by Grodd, Caitlin detects the same spike in Barry's primary motor cortex they detected in General Eiling. The anti-telepathy strip Cisco and Caitlin design uses magnetic resonance to neutralize all foreign neurological stimulus. Barry: Maybe we both got whammied? Iris: (from the hallway) Then you know how it feels? Iris: Hi Barry. Or should I say "The Flash"? Iris: Wait, wait, wait... you're telling me my dad knew?! And he told you not to tell me?! Barry: He was trying to protect you. We both were. Iris: Yeah, well maybe it's time you both stopped. Joe: Look... baby, the way I went about things, maybe... no. I was wrong. I was just trying to keep you safe. Iris: You know, that excuse is getting really old. First, it was the police academy. And then it was dating Eddie. And now this. Iris: Wells killed Mason? And you're covering that up?! Joe: No. No, no, no, no, no, no, no, no. If the world finds out about Wells, they find out about Barry. I'm trying to keep him safe too. Iris: Did you ever stop to think that looping me in would keep me safe?! That if I knew what was going on out there, I could prepare for it?! Maybe I could have helped you and Barry put the bad guys away instead of being in the way?! Iris: Dad! It's not just about Barry being The Flash! You knew how he felt about me for God knows how long and you didn't tell me that either! Joe: That wasn't for me to tell, Iris. Iris: Well, you know what?! If any of you had been honest with me, maybe Eddie would still be here. He wouldn't have gotten involved with any of this if I hadn't been dating him. Joe: Are you saying that if you knew how Barry felt...? Iris: What I'm saying is that what happened to Eddie is your fault. Joe: This is work. We can finish this talk. Iris: (cooly) Talking. Yeah, that will be new. Cisco: Why is Eiling bad? Eiling: Eiling.. .hurt.. me. I... hurt... Eiling. Barry: So if you're not Eiling, then who are you? Eiling: I... am... Grodd! Fear.... me! Iris: I can't get that sound out of my head. My dad screaming... why did he insist on going down there with you? He's always preaching about being safe but not once does he think about running into danger himself! Iris: No, Barry! He's just a regular cop. He's not some metahuman with superpowers. He's not you! Barry: You're right. He's not me. And this isn't his fault. None of this is his fault! Look, yes, maybe Joe told me not to tell you that I was The Flash. But I didn't have to listen. I could have told you 100 times! I could have told you! And I didn't. Yes, I should have. So you're right to be mad. But don't be mad at your dad. Be mad at me. Iris: Okay. Okay, then explain to me how the person I thought I knew better than anyone has been keeping secrets from me? Big, life-changing secrets? You were supposed to be my best friend, Barry! Barry: I am your best friend! Iris: How can you say that when the most important things in your life, the things that matter the most, the things you're supposed to share, you kept all of them from me?! You lied to me about everything! Barry: I know, Iris. Look... I know! But you haven't been entirely honest with me either! Iris: What? What are you talking about? Barry: At Christmas, when I told you how I felt, you said that you didn't feel the same way. But I just feel like... I don't know. That maybe things aren't that simple? (pause) Am I wrong? Barry: You will get what's coming to you. Eventually. Eiling: I'm not ashamed of my actions, Mr. Allen. You've seen what these metahumans are capable of. Soon your prison won't be enough. Barry: Not all metahumans are dangerous. Eiling: You're afraid that I know you're The Flash? (chuckles) Don't get your tights in a twist. I've known for months. If I wanted to come after you, I would have done it by now. Barry: But you think you're going to need me. Eiling: Harrison Wells turned me over to that beast. Used me like a damn puppet. So like it or not, we have a common enemy, you and I. Now if you'll excuse me, I have a gorilla to hunt. Barry makes reference to the psychic attack of The Rainbow Raider from 108, comparing it to Grodd's attack. He notes that while Rainbow Raider inspired anger, Grodd's psychic attack inspires fear. Iris explains that she learned Barry's secret identity after experiencing an electrical shock while touching The Flash that matched one she felt once before when she held Barry's hand while he was in a coma, as revealed in 120. Joe refers to the death of Mason Bridge from 116. It is revealed that Grodd did not kill General Eiling back in 114, but instead overwhelmed his mind, turning him into a psychic puppet. According to ARGUS, General Eiling has been missing for three months (i.e. since 114) and his disappearance is being covered up according to John Diggle's wife, Lyla. General Eiling knows Barry's secret identity and has known for some time. Joe is afraid of gorillas. Grodd refers to Eobard Thawne as his father and notes that his father hate guns. Barry refers to his confessing his love to Iris in 109. Eobard Thawne claims that the Thawnes are a well-respected family in the future, birthing politicians, scientists and captains of industry. He claims Eddie Thawne is the only one who did not become notable in some way and is forgotten by history, his career as a police detective being spectacularly uneventful. The ring Eddie proposed to Iris with came from his grandmother, Agnes Thawne. Cisco refers to Barry's fight with Girder and the Super-Sonic Punch (106). The end of the episode reveals that Wells has been hiding inside The Pipeline and has the means to reactivate the particle accelerator at STAR Labs. How Grodd is able to block Barry's supersonic punch isn't explained. Perhaps his reflexes and perception have been enhanced along with the rest of his brain? Not bad but disappointing in how it failed to live up to its hype. The long-awaited reveal of Grodd takes a backseat to Iris dealing with the knowledge that all of her friends and family have been lying to her for months. And while the scenes with Grodd are good, they still play second-fiddle to the Iris drama. Thankfully, Candice Patton manages to make all these scenes work but the episode still ultimately seems packed full of filler, as virtually nothing has changed since the end of last week's episode, save that Iris has vented her spleen over how badly she's been treated all year.